THIRTY SEVEN: It all came crashing down. I am blogging from the past. Very talented, I know. I can even make it look like it’s August 31st. If you have been reading, you may have picked up on how busy I have been in the last month. Recreational time has been minimal. As things wound down, and it was getting closer to September (where I knew I’d have more time to relax) all I wanted to do was read Calvin & Hobbes. I grew up reading it. Every Sunday in the newspaper, my brother and I would scramble to grab the Sunday Funnies (with Calvin and Hobbes on the main front page). Every Christmas I would inevitably receive a Calvin and Hobbes book (which would be finished by boxing day). 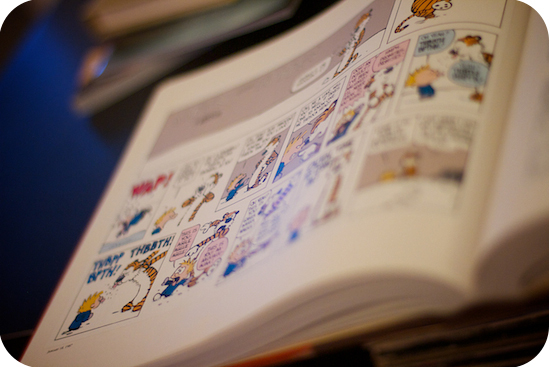 A few Christmas’s ago Dave bought me the entire collection of Calvin & Hobbes. Three HUGE books, all in order of when they were written (10 years worth). It is, by far, one of my most favourite Christmas gifts ever. My schedule has finally slowed down. And after being so busy during the hot summer months, I was pretty happy to see the rain. And the weather was RAINY. It poured all day while I was at work, and all I could think about was getting home, putting on my fuzzy slippers, wrapping up in a blanket and reading. Dave had some comfort food all ready for dinner when I came home at 6:30 (pizza buns…mmm…) We were going to watch “Wrath of Khan” after we ate, but I said I wanted to read first. Just for a little bit. But by about 7:30 I was asleep. With my fuzzy slippers, and Calvin and Hobbes laying on my lap.